Do your apps miss you? Mine do. I’ve been told time and time again. I used to think the apps just really liked me. But I’ve realized over time that they’re all the same. I know they tell their sob story to everyone they meet. “We miss you,” they tell me. “It’s been too long,” they try to convince me. They’ve begged, pleaded and borrowed my limited screen space with last-ditch efforts to lure me back. But their efforts have become futile. I’ve realized that it’s simply a marketing tactic, and I’m just a regular user. If you’ve seen your marketing courtship efforts lose their luster over the past few years, fear not app marketer. It’s time to mend your broken heart and show your users the true you! Retail has seen firsthand how eCommerce has changed the way people shop. Long gone are the days of flipping through huge mail-order catalogs. We’ve upgraded to digital versions with deals that are updated on a daily, or even hourly basis. While some have suffered in the wake of this evolution, others have embraced it through creative apps that take advantage of the user who is always on the move. If you’re struggling to find a way to market to your users, we’ve identified four app campaigns to get your gears in motion. While it’s OK to tell your users that you miss them every once in a while, it’s not a sustainable strategy to keep people continuously engaged with your app. Take a look at these campaigns and tweak them to match the voice and style of your own brand. Remember, keeping it personal can go a long way. So maybe you didn’t make the best first impression. You came on a little too strong. It’s ok, it happens to the best of us. Twenty percent of users use an app only once, so you’re not alone. But we’re guessing you’d like to be in the other 80%. If users have forgotten about the awesomeness that is your app, don’t agonize, recognize (the opportunity)! Every day, items are abandoned in virtual shopping carts throughout the world. There are countless reasons for this. Is the checkout process too long? Are shipping prices too high? Are they not confident enough if the product? The good thing for you is that you don’t have to understand the true reason for abandonment to combat it with a strong marketing campaign. One thing we do know is that shoppers love free shipping. According to a recent comScore study, 83% of people are willing to wait an additional two days for shipping if it’s free. If you have a big segment of users who have abandoned their carts, there is good chance free shipping is one of their top priorities. In order to re-engage them, send them a push notification with the news they’ve been waiting to hear. It just might be the little incentive they need to convert them from shoppers to buyers. In Q4 of 2013, mobile was the most popular medium for accessing social networking sites. While many social networks have retrofitted their apps to accommodate mobile user needs, others, like Instagram, built its entire product for the mobile platform. At its core, it’s just a camera app. In order for users to participate in the social network, they are inherently required to use their phone. It’s no wonder that Instagram is the fastest growing social site in the world. You don’t have to be a popular social network to utilize the built-in features of the phone though. The camera can be an incredibly powerful feature for visualizing your content. You might think Home Depot is just a store to find bathroom faucets or ceiling fans. But what if you wanted to see what they look like in your home, before you buy? There’s an app for that. The Home Depot’s “Augmented Reality Mode” puts the item you’re viewing in the camera’s focus, and then lets you take a picture which saves straight to phone along with item name, model # and SKU # (and the Home Depot logo of course!). By fitting your app with these built-in features, you create an easy-to-use, yet unique app experience without spending time and effort developing completely unique features. If you want to witness the hefty competition in the retail space, just go to your local mall and browse the directory. Anything not labeled “Fast Food” is probably a retail store. As you stroll the hallways looking for the right place, the store windows clamor for your attention: 15% off here, BOGO over there. How do you figure out which store is worth checking out? You can make a quick assumption based on the storefront, but you’ll get a better sense once you walk in the actual store. The app world isn’t much different. As people scroll through the list of potential apps, they have to make a quick assumption based on a select few cues like logo and reviews (your storefront). Once they’ve done their due diligence and decided to download your app, you have to make that great first impression. If you walked into a new store for the first time, and an employee gave you a 20% coupon to use on your first purchase, you would probably feel pretty inclined to buy something there. When someone downloads your app for the first time, why not give them this same feeling? Welcome them, and make them an offer they can’t refuse. Flash sales are marketing campaigns that send highly time-sensitive, digital coupons to users. Unlike their in-store counterparts, these sales can be limited to hours, or even minutes. The key to successful flash sales is segmenting your users into two different value segments: high- and low-value. Only you will know what constitutes value for a user, but once you establish it, you can target these groups with more personalized messages. Your high-value users likely use your app multiple times per week and have purchased a few items through it. Low-value users might use your app occasionally, but typically just for “screen shopping” (the app equivalent of window shopping). High-value users have already pre-qualified themselves. They are more likely than any other user segment to purchase something on your app, so why not target them with a killer offer? But don’t forget about your low-value users. Any increase in their retention or lifetime value is great for your business. Are You Offering Real Value? It’s now more important than ever to offer real value and unique features to your users. 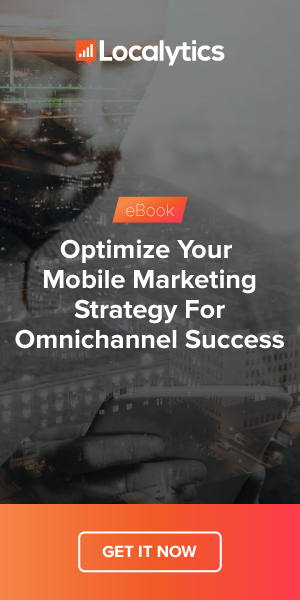 With the abundance of eCommerce and retail apps on the market, it’s easy to get relegated to the fifth page of a smartphone screen, or worse, uninstalled! But by following these tips for your future app marketing campaigns, you give your users a reason to keep your app front and center on their home screen.